Weighing up to 80,000 pounds, tractor-trailer trucks (also known as semis and 18-wheelers) can cause horrendous damage and injury when they are involved in an accident – especially with a standard size passenger car. Truck accidents are particularly dangerous because of the sheer body mass of the truck, the speed it may be traveling, and road conditions. Tractor-trailers are super-heavy, extra-large machines on wheels that routinely run at speeds topping 60-70 miles per hour, even in rough weather. In addition, the driver may be fatigued from long hours on the road or may even have been talking on the phone or texting. Taken together, these factors can combine to create extremely dangerous accidents that result in serious injury or fatality. Only a thorough investigation by experienced, trained professionals can unearth causes like these and assist an injured party in making a solid case for a claim against those responsible. We accept all injury cases on a contingency basis, meaning you pay nothing unless we recover for you. 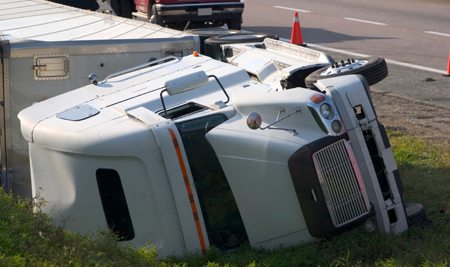 If you have been injured in a truck accident, call us TODAY for your free, no-obligation legal consultation.